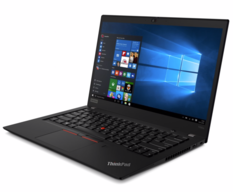 We showed you our two test configurations of the new ThinkPad models T490s ad X390 a couple of days ago. There have been many comments and questions about the displays, so we decided to publish our initial results. We also added the results of the respective predecessors for better comparison; in the case of the T480s both the WQHD as well as the 1080p SKUs. Let's start with the good things. The Full-HD panel of the T490s is much brighter and reaches the advertised 400 nits at some measurement points. This makes it much brighter than the previous 1080p SKU and even the WQHD screen is beaten. The black value does not suffer, which results in an excellent contrast ratio. The panel of the X390 is also brighter with an excellent contrast ratio. The biggest (positive) is the improved color accuracy, which is not common among business devices. Both models cover almost the full sRGB gamut and the DeltaE-2000 deviations of all colors are below the important mark of 3 after our calibration. We also encountered one drawback: long response times. They result in clearly visible ghosting (very noticeable when you move the cursor or windows). Expect our full in-depth analysis of the screens in our upcoming reviews.